The association of plant disease with extreme weather is well documented, so it is no surprise that this year's extreme weather with record cool temperatures and plenty of rain has created favorable conditions for disease development in soybean. 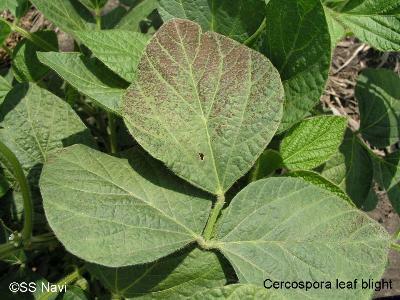 Disease that we are seeing includes sudden death syndrome (SDS) and several soybean foliar diseases, the most prevalent are Cercospora leaf blight, soybean brown spot, bacterial blight, and downy mildew. As August temperatures begin to heat up diseases such as Cercospora and frogeye leaf spot can increase. This will create a mixed bag of cool and warm diseases that can cause premature defoliation. Because of the potential disease mix, assessing the risk to crops is difficult. Cercospora leaf blight was wide spread in July, but was low in intensity because low temperatures aren't favorable to the development of this disease. With increased August temperatures, reports show that this disease has picked up steam and built up quickly. ISU field agronomists Mark Carlton and Virgil Schmidt in southern Iowa are seeing fields with high levels of infestation of Cercospora leaf blight. Similar high level of the disease was reported by Brian Lang in northeast Iowa. Soybean leaves infected by Cercospora have a leathery appearance and turn a mottled purple-to-orange color on the upper surface. Expression of these symptoms varies with varieties. Sometimes, this disease can be confused as "sunburn," with symptoms appearing on the lower leaf surface. If a summer is cool, the chance of sunburn is small. This July has been one of the coolest summers in Iowa, which is not favorable for sunburn development. This also happened three years ago in a cool summer. Identifying this disease requires experience in taking free-hand sections for observation of the fungus under a microscope. All samples from Iowa that we examined had Cercospora kikuchii, the causal fungus of this disease. Brown spot, caused by the fungus Septoria glycines, is another foliar disease commonly seen in July. Symptoms include many irregular, dark brown spots on both upper and lower leaf surfaces. Adjacent lesions frequently merge to form irregularly shaped blotches. Like bacterial blight, this disease occurs every year. 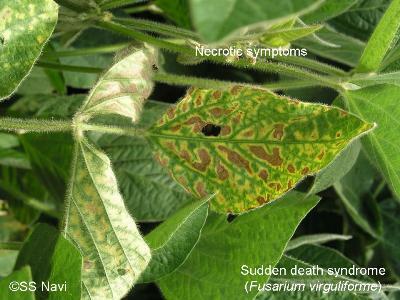 Disease symptoms occur on the lower leaves of soybean plants and progress upward as the plant develops. 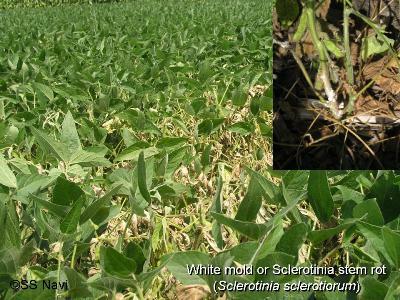 Brown spot usually does not cause early defoliation unless the disease progresses due to frequent rains later in the season. Downy mildew has been wide spread this summer because of cool weather. The last time the disease was wide spread was in 2004, also a cool, wet season. High August temperatures should stop the development of this disease until late in the month. 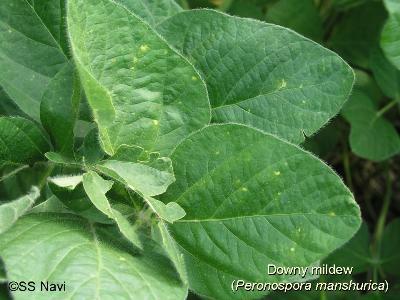 Fields with downy mildew may see more disease at that time if there are dews and mists. Except for affecting seed quality, little data is available on the reduction of soybean yield by this disease in Iowa. Use of fungicide can prevent early defoliation when foliar disease risk is high. One question I receive most often from producers is whether to spray or not. This is a site specific question. For fungicide applications, please see our other articles on fungicide applications. Sudden death syndrome is showing up in east central Iowa this year. In the areas we have visited, the severity was the highest we have experienced. Although the disease has also been observed in other regions of Iowa, the level and extent of this disease is yet to be determined; that will be clearer later in August. In 2006 the disease showed up very early, with many reports before the first week of July. Like 2006, cool temperatures this summer may have contributed to its occurrence. 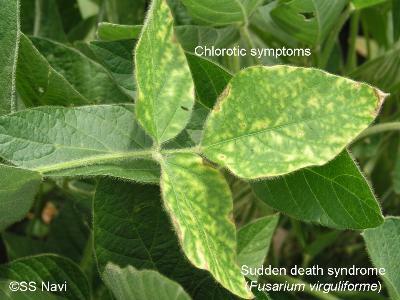 Plants with SDS have leaves exhibiting chlorotic spots and necrosis between green veins. The roots of these plants have deteriorated. The simplest method of identifying SDS is to look for bluish fungal colonies on the taproot in severely affected plants. Once patches of SDS are found, it would be wise to avoid planting susceptible varieties the following season. Resistant or tolerant varieties should be planted in fields that have history of SDS. Good varieties have been developed and are available from many seed companies in Iowa. Fields that has been applied with Contans should have low risk and growers have observed less disease after use Contans in soybean fields previously had severe white mold. XB Yang is a professor of plant pathology with research and extension responsibilities in soybean diseases. Yang can be reached at (515) 294-8826 or by emailing xbyang@iastate.edu. SS Navi is an assistant scientist working on soybean diseases. Links to this article are strongly encouraged, and this article may be republished without further permission if published as written and if credit is given to the author, Integrated Crop Management News, and Iowa State University Extension and Outreach. If this article is to be used in any other manner, permission from the author is required. This article was originally published on August 10, 2009. The information contained within may not be the most current and accurate depending on when it is accessed.